Once you have built GDPR compliant forms, visitors also need to be able to view and delete their data. Adding the entries on the front-end with a view is one way to approach this. Read more about using views for GDPR compliance and the right to access and be forgotten. You may need an easy way to access all personal form data without creating a view for each form. Or if the requestor does not have a user account, views may not be the most secure option. 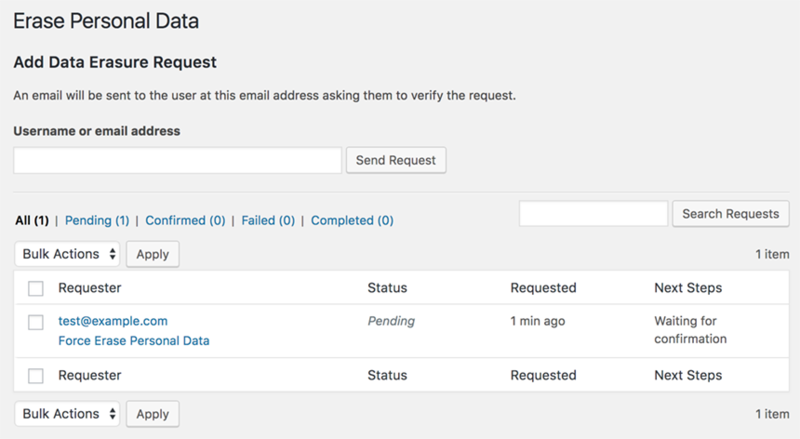 WordPress also includes a page to export all data linked to a specific email address. Formidable Forms is integrated into the export. Formidable finds the entries that include the email address in any field of a form, or entries that were created by a user with that email address in their WordPress user profile. To export this data, go to the WordPress 'Tools' → 'Export Personal Data' page. When someone requests their personal data, insert their email address in the form. The export will include a 'Form Submissions' section if that email address or user is found in any Formidable entries. The data included in the export file, can be immediately deleted. Go to the WordPress 'Tools' → 'Erase Personal Data' page. This page works just the same as the export page. But be very careful with this option. The form entries will be permanently deleted and can only be recovered from a backup if you have one.